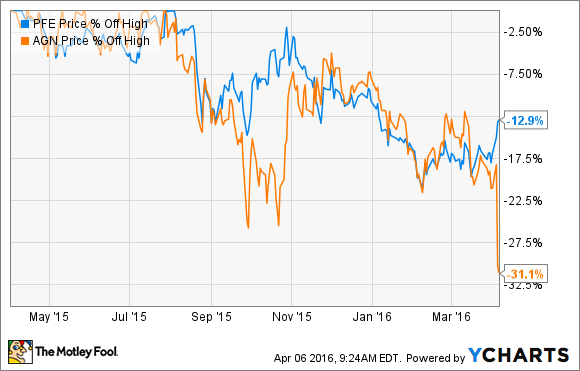 Pfizer vs. Allergan: Which Is the Better Breakup Buy? In the wake of the mega-merger deal being called off, which of these two pharma giants is the better value? Well, its official -- the $160 billion megamerger between pharma giants Pfizer (NYSE:PFE) and Allergan PLC (NYSE:AGN) is dead. News broke this morning that the two companies have called off their merger agreement following the new rules set forth by the U.S. Department of Treasury that were aimed at putting a damper on tax inversion deals. Allergan's shareholders haven't been taking the news well. Shares dropped 15% on Tuesday after the new government rules were released, almost certainly on fears that the deal would be called off. Those worries look well justified in the wake of the news today that Pfizer did indeed back out. With the deal dead, some investors might be thinking: which of these two pharma giants is the better breakup buy? Let's take a closer look at the businesses to see if we can ascertain an answer. After losing patent protection of Lipitor, the company's megablockbuster LDL-lowering medicine, Pfizer's top-line has been heading in wrong direction. However, the company looks finally poised for growth again due to a handful of newly launched drugs that look poised for growth. Investors should be particularly excited about cancer drug Ibrance. The drug rang up $723 million in less than a year and is poised to reach blockbuster status this year. Analysts see this drug eventually reaching peak sales of more than $3 billion. Another drug with huge potential is Prevnar 13, a pneumococcal vaccine. Since the CDC recommended the vaccine for adults aged 65 in 2014, sales have been explosive -- up 102% last year alone. In total, Pfizer pulled in more than $1.8 billion in sales of its Prevnar family of vaccines last year, and the year ahead should be another one of strong growth. In addition, Pfizer is at the forefront of the biosimilar wave that is slowly hitting the U.S., thanks in large part to its $16.1 billion acquisition of Hospira. You wouldn't know it, with all of the attention on the busted merger, but Pfizer actually had a huge announcement released yesterday. Pfizer and its partner Celltiron won FDA approval of Inflectra, a biosimlliar version of the Johnson & Johnson blockbuster drug Remicade, which brought in $4.5 billion in sales just in the U.S. last year. This is only the second time that the FDA has approved a biosimilar drug. Add it all up and analysts are predicting that Pfizer will be able to grow its bottom line by mid-single digits for the next 5 years. Mix in the company's juicy dividend yield of nearly 4% and Pfizer looks capable of producing a double-digit total return. While Pfizer's top-line has been in reverse over the last few years, Allergan's revenue growth has been torrid. Thanks to a series of huge acquisitions, Allergan's revenue has grown from $2.6 billion in 2013 to a whopping $15 billion last year! Not all of the growth has come from acquisitions; Allergan's legacy drugs like Botox, Restates, and Linzess have been holding their own. In fact, each grew at double digit rates in the fourth quarter. The company has recently launched a few other drugs like Dalvance (an antibiotic that treats acute bacterial skin and skin structure infections) and Viberzi (a treatment for irritable bowel syndrome) should help ensure that revenue keeps growing at a healthy pace. It should also be noted that Allergan sports an enormous pipeline that has 70 programs in the mid-to-late stage. In fact, in 2016 alone the company believes that it should receive 14 approvals,and it has plans to submit another 16 projects for regulatory submissions. Finally, Allergan is still planning on moving forward with its plan to sell its Actavis Generics business to Teva Pharmaceuticals for $40.5 billion, most of which is is receiving in cash. The deal is expected to close in June of this year (although if today teaches us nothing else, there are always potential surprises) and could go a long ways toward paying down the company's enormous $41 billion debt load. With a strong product lineup, a pipeline packed with potential, and a plan to clean up its balance sheet, Allergan has a clear plan to win with or without Pfizer. In total, analysts believe that Allergan should be able to grow by more than 10% annually over the next 5 years, which is a solid rate for a company of its size. With both companies poised for growth over the coming years lets see how the markets are valuing each to help us determine which could be the better buy. As you can see, both Allergan and Pfizer are trading at premium valuation based on trailing earnings, but they each look fairly cheap on a forward basis. The reason that they both look so appealing when using next year's earnings is because both companies have seen their stocks fall over the last week months. Each is down by double-digits from its 52-week highs. Allergan's stock in particular has been crushed particularly hard. I think there's reason to be bullish on both companies from here, but if forced to choose my favorite buy right now I'd have to give the edge to Allergan. Its faster growth and discounted share price are simply too tempting to pass up. After all, when the announcement of the merger first hit the wire it valued Allergan's shares at over $300 each. Shouldn't that make today's price of roughly $245 seem like a steal? Or consider this: On November 20th, 2015, the last trading day prior to Pfizer announced its takeover offer, shares of Allergan closed at $312 while Pfizer closed just over $32. Pfizer's stock is basically flat since the deal was announced, while Allergan has been given a serious haircut. That implies to me that there is simply more value in Allergan's shares today than there is in Pfizer's, hence why I think it's the better breakup buy.